Behavioral and Social Sciences, B.S. The Bachelor of Science in Behavioral and Social Sciences is an interdisciplinary degree program designed to prepare students for the demands of a diverse, global workplace and helps meet the current workforce need for flexible problem solvers who transcend traditional disciplinary boundaries as they seek solutions to real world challenges. The skill set for this degree includes: critical thinking, decision making, data analysis, problem solving, networking, interdisciplinary thinking, team building, interpersonal skills, flexibility, and strong oral and written communication skills. The Bachelor of Science in Behavioral and Social Sciences is part of the End Zone Initiative and offers credit for previous course work from NCCU, other accredited institutions, and military credits. 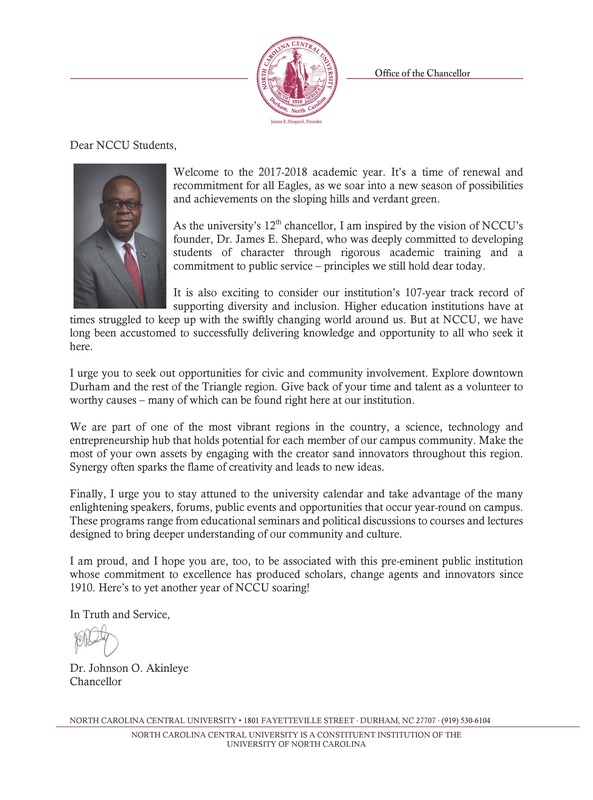 See www.nccu.edu/endzone. Complete a minimum of 120 semester hours with the last 30 hours being completed at NCCU. A minimum grade point average of 2.0 overall must be achieved with no grade lower than a “C” in any departmental requirement. Complete the General Education Curriculum (GEC) of 39 credit hours required by the university. MSCM 1250 Elements of Speech or MSCM Introduction to Public Speaking satisfies the GEC speaking intensive requirement. SOCI 2300 satisfies the GEC writing intensive requirement and is a major requirement that is not counted in the GEC hours. There are no non-departmental requirements. Life experiences, such as internships and public service, and/or military service will be equated with related courses where applicable. These equivalences will be requested by the academic advisors and approved as appropriate by the appropriate Dean. Must complete 24 semester hours in any approved discipline or thematic area. Must complete 27 semester hours of courses from any area.